A retaining wall is a vertical, self-supporting structure constructed of concrete, durable wood, masonry or other materials, designed to resist the lateral displacement of soil or other materials. The term shall include concrete walls, crib and bin walls, reinforced or mechanically stabilized earth systems, anchored walls, soil nail walls, multi-tiered systems, boulter walls, or other retaining structures. The provisions in Subtitle C, Chapter 14 on retaining walls provides regulations for the construction of retaining walls in any Residential or Residential Flat zone. Berms or other similar forms of intermittent terrain elevation shall not be included in measuring retaining wall height. 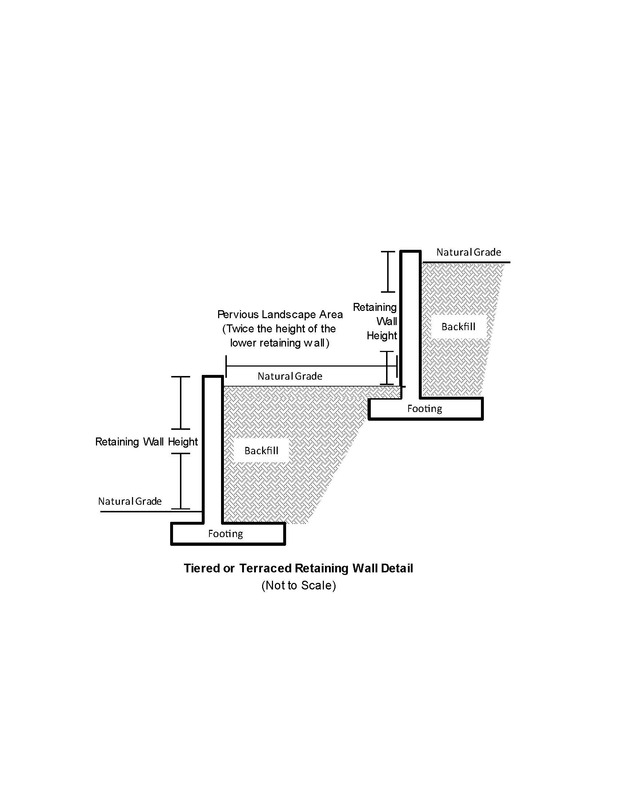 The maximum height of a retaining wall shall be six feet unless the wall is along a street frontage or property line, within a required setback, within 25 ft. of a rear property line in a R-1 zone, within 20 ft. of a rear property line in a R-2, R-3, or RF zone. Under those circumstances, the maximum height of a retaining wall shall be four feet. Retaining walls located on any area between a property line and a building line shall not exceed a maximum height of 42 in. A retaining wall abutting an improved alley in the R-3 or RF zones shall not exceed a maximum height of 12 ft. Retaining walls may be tiered or terraced provided that the width of the area between each retaining wall is at least twice the height of the lower retaining wall. The area between each wall shall be pervious and may not be paved or otherwise covered with impervious materials.